They talked about, among other things, how they met while they worked at what was then Scott Paper Co. in Winslow — Ann had a union job, Paul was a member of management. Nor does this one know how to govern. 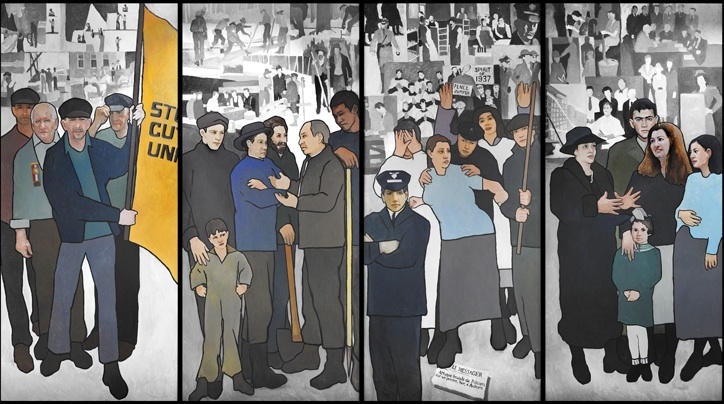 We won’t waste valuable space this morning trying to discern what was going on in LePage’s head when he ordered the removal of a mural and the names of meeting rooms — all commemorating Maine’s deep and rich labor history — from the headquarters of the Maine Department of Labor. Searching for rational thought inside this guy’s noggin, after all, is like wandering through an abandoned coal mine without a headlamp. Besides, it’s the things LePage clearly didn’t think about that make this latest assault on Maine’s sensibilities so stunning. For starters, he didn’t think about his own heritage as a French-speaking kid growing up on the rough-and-tumble streets of downtown Lewiston. 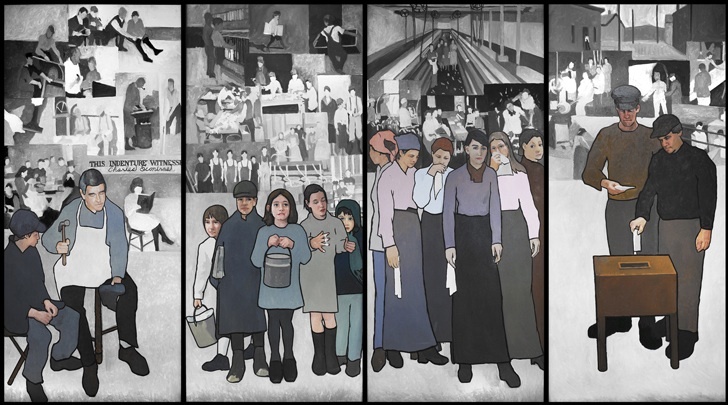 Panel Seven in Maine artist Judy Taylor’s widely acclaimed, 11-panel homage to Maine workers focuses on the 1937 shoe mill strike in Lewiston-Auburn. Seventy-four years ago today, 5,000 of the area’s 6,300 largely French Canadian shoe workers voted to walk off the job over low wages, dangerous working conditions and discrimination, to name but a few of their grievances. They shut down 19 shoe factories before it was over, but paid dearly when police and then the National Guard moved in and forcibly put down the insurrection. 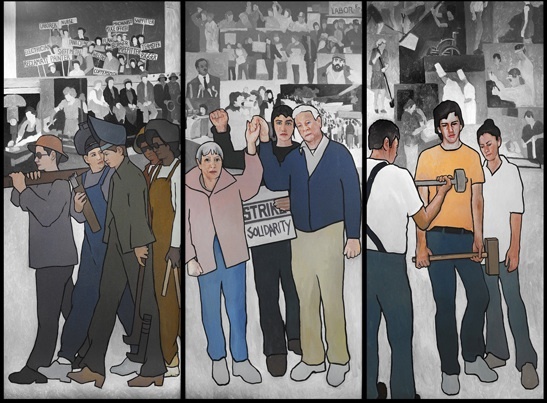 Nor, speaking of history, did LePage stop to think that Taylor’s Panel Three (“The Textile Workers”), Panel Six (“The Woods Workers”) and Panel Nine (“Rosie the Riveter”) all celebrate eras in which hard-working Mainers, through their own sweat and blood, made this state what it is today. Also lost on the governor is the simple fact that the Department of Labor, by definition, exists first and foremost to protect Maine’s workers. The laws and regulations it enforces are in place because without them, those forlorn child laborers in Panel Two (“Lost Childhood”) would still be walking around with bandages on their hands, and that parade in Panel Five (“The First Labor Day”) would have dissolved into just another endless September workday. Born of Maine parents, Perkins went on to become the first female member of a U.S. Cabinet — she was secretary of labor through the 12-year presidency of Franklin D. Roosevelt and played a lead role in the creation of our Social Security system. Her lifelong love of Maine is reflected in the Frances Perkins Center, on the family homestead in Newcastle, where Executive Director Barbara Burt found herself shaking her head in disbelief Wednesday at our “very mean-spirited” governor. “Unemployment insurance, child labor laws, workplace safety law, the minimum wage — those are all things that you can directly trace back to Frances Perkins,” said Burt. That feedback undoubtedly came from Team LePage the moment it first entered the building. And those labor department employees who may hold a different view have been told in no uncertain terms to shut up and keep working. “Whether or not the perception is valid is not really at issue and therefore, not open to debate,” wrote Boyett. In fact, coming just a few days before Friday’s 100th anniversary of The Triangle Shirtwaist Factory Fire in New York City — 146 young women perished that day in what Frances Perkins later called “the birth of the New Deal” — it’s an insult to those who over the last century fought, and sometimes died, for the workplace rights we all take for granted today. Back when the LePages sat down with Bill Green, Ann LePage portrayed the governor as the kind of guy who always identifies with the downtrodden because, as an 11-year-old who left home after his abusive father put him in the hospital, he’d been there and done that. To paraphrase her father, she had to be kidding.